Network Signs has been established for over 20 years. We provide a comprehensive service for design, manufacture and fitting of signage and graphics for shop fronts, shop windows, vans, cars, lorries, coaches and tankers as well as office interiors. Vehicle graphics can be fitted at our work shop based in the Southside of Glasgow or we offer a mobile service where we come to you. All our staff are fully trained and have many years experience in the sign industry. We can survey, design, manufacture and install where needed for retail, industrial, office, restaurants and schools etc. 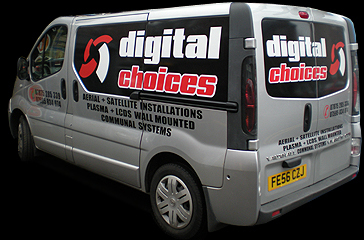 Network Signs can provide you with numerous advertising solutions, from vehicle wraps, which make use of every surface of your vehicle or fleet of vehicles, to graphic panels covering the sides only. Whatever your requirements and whatever your vehicle here at Network Signs we have the technology to produce colourful, digital graphics in your own specific style, or why not allow one of our talented graphic artists to create a design for you. Artwork should be supplied at size, in Adobe Illustrator (.ai), Corel Draw (.cdr), Postscript (.eps), or .pdf, in vector, with fonts converted to curves. All colours should be named with PantoneTM references when possible.